Brix, under jockey ergio Becerra, Jr., setting the top qualifying time to the West Texas Derby(G3) Friday afternoon at Sunland Park Racetrack & Casino. SUNLAND PARK, NM�MARCH 7, 2014� Brix, a lightly races son of World Champion WAVE CARVER, posted the top qualifying time from five trial races run Friday afternoon for the $160,577 West Texas Derby(G3). The 10 fastest qualifiers will return to Sunland Park Racetrack & Casino on Saturday March 29 and vie for the $75,471 winner's purse. Under jockey Sergio Becerra, Jr., Brix dueled throughout with Sunland Park Winter Futurity(G3) winner Bye Bye Eagle Eye in the second trial before pulling away to a half-length win and the top qualifying mark of :19.099 seconds for the 400 yards. Gene Bruden saddled Brix to his second win in four starts for owner 21 Partnership. 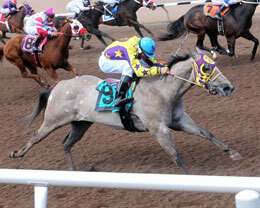 Bred in California by Legacy Ranch, LLC, the gray gelding is out of the Strawfly Special mare Tender Flyer. His only other win came in the Rainbow Futurity(G1) trials at Ruidoso last summer. He was making his first start since August. For the complete list of West Texas Derby finalists, times, sires, dams, owners, breeders, trainers and jockeys CLICK HERE.